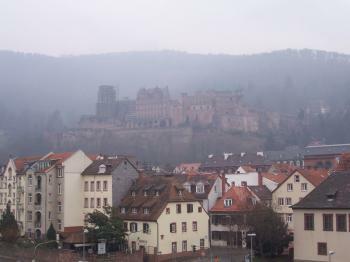 Heidelberg, town and castle has been part of the Tentative list of Germany. I visited this great town while driving around the Upper Middle Rhine Valley. The small squares are really worth visiting as well as the castle and bridge to view the city from the other side of the river. The highlight of my trip was to hire a self-drive boat just before sunset and enjoy the last red rays over Heidelberg. I must say I really enjoyed my visit and would gladly return in the future. I must agree with ICOMOS: Heidelberg as an historic town has none universal value worth considering, but as a university town, paired with other university towns in Baden-W�rttemberg and Hessen, I can see another successful declaration for Germany. Heidelberg is nice, but I personally prefer other university towns, such as Freiburg or Marburg (I lived in this last one.) The university buildings are well conserved, and this feeling the students give to the city, is what really makes it special. I see potential here, lets hope the germans see it too. We saw in the New Year 2008/09 in Heidelberg and it was a really great place to do it. The river banks bridge and castle were lined with people letting off fireworks and toasting with champagne. The centre of the city is on one bank of the river and is a cluster of old cobbled streets and grand edifices. There are plenty of shops and churches but the main point of focus is the romantically ruined castle sitting above the town. It is a great walk up, which offers spectacular views along the valley. The contents of the castle itself are reasonably interesting however the views and its half ruined architecture are the real draw. Back down in the centre, the University buildings take up a large amount of the space and provide a relaxed atmosphere. This University heritage is the basis of the proposed site and it seems that ICOMOS are dragging their feet over it. The latest recommendation is to combine University towns in the area into one larger site. This may bring a new aspect to the inscription, and make it stand out more. Heidelberg by itself would be fairly justified in being inscribed, however the list is full of pretty European towns so this would not add anything new to the list. Even if it doesn�t get inscribed it is well worth a detour to see. We had great fun moving between some very charming beer halls (Kulturebrauerei, Palmbrau Gasse and Vetter im Sch�neck all get strong recommendations) and watching the skaters at the Christmas market. Whilst it will not add much new to the list this, Heidelberg is the equal of many towns already inscribed, and is well worth a visit. To demonstrate the Outstanding Universal Value and highlight the castle and the university tradition. Also suggests a serial nomination with other university towns. To demonstrate the outstanding universal value of the property and highlight the importance of the Castle and the university tradition.